When simple devices pose technical challenges. Paul and Max brew their own beer. Paul: Now lautering: run off the wort from the spent grain. 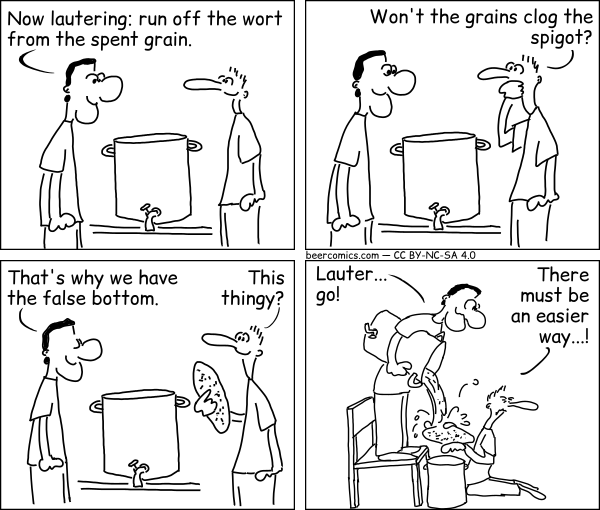 Max: Won't the grains clog the spigot? Paul: That's why we have the false bottom. Max: There must be an easier way...! False bottom by Robert Wenner is licensed under a Creative Commons Attribution - NonCommercial - ShareAlike 4.0 International License. Permissions beyond the scope of this license may be available upon request at https://beercomics.com/imprint.html.